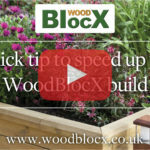 WoodBlocX are a quick and easy way to bring your garden to life. Allowing you to create raised beds, ponds or retaining walls as well as a whole host of other creations. The slowest part is digging the ground to get the first row straight and level. Once this is done it is a simple process to build up the higher rows. Two people could build a wall 10m long by 5 rows high in a day. And with the quick tip in this video you could even go a little faster.